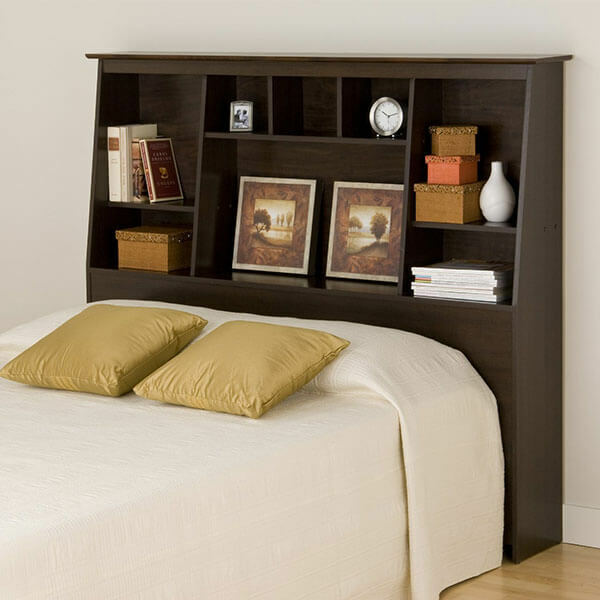 The Espresso Full/Queen Tall Slant-Back Bookcase Headboard allows you to enjoy both a handsome headboard and convenient storage. It features eight different compartments for the things you want near and is made out of laminated composite wood that has been given a deep espresso finish. The dimensions of the headboard measure 65.75 inches by 55.75 inches. Keep all of your nighttime essentials close at hand with the Prepac Monterey Cherry King Storage Headboard. This headboard is made out of high quality composite woods that have been given a laminated finish. The headboard measures 81.5 inches in width by 43 inches in height by 11 inches in depth. Minimalistic and simple, the Sauder Orchard Hills Bookcase Headboard features a few small cubbies for you to keep your bedside essentials in. It comes with two adjustable shelves and cord access in the back panel for your convenience. This headboard has been given a handsome Carolina Oak finish. Coordinate with other matching Prepac Monterey furniture. 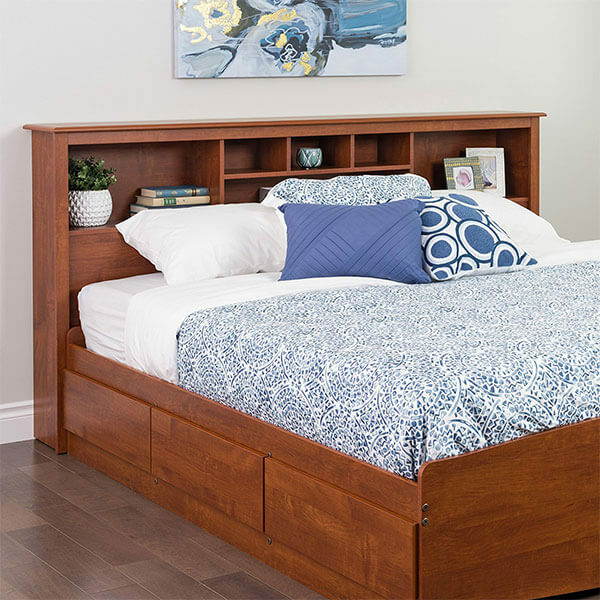 With plenty of cubbies and shelves to utilize, the Prepac Monterey White Queen Storage Headboard is a durable, convenient headboard that keeps all of your bedside items close at hand. The headboard is made out of top quality laminate composite woods and measures 65.75 inches in width by 43 inches in height. Perfect for both queen and full beds, the Sauder Rum Walnut Finish County Line offers plenty of space for storing books, medicine, alarm clocks and more. It has an enclosed back panel that features convenient cord access. Its rum walnut finish allows it to fit into any décor. With its sleek black nature, ample shelving and enclosed cabinet, the Black Kallisto Bookcase Headboard is ideal for any bedroom style. It features two doors that have adjustable hinges and feature oval, brushed nickel knobs. The headboard has been given a handsome, stark black laminate for its finish.